Does Not Work Power Source Check all components are connected and corrected power supply 110VAC. Use multi-meter, check breakers. Probe Check probe to see if plug is attached, disconnect Power and check multi-meter for short, and/or Remove probe from drain and check for visual damage. Water is WARM Thermostat Re-set thermostat higher to desired water temp. 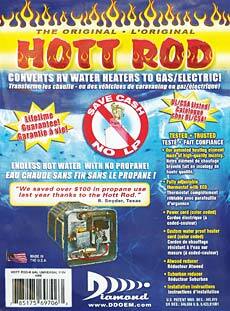 Water is too HOT Thermostat Check thermostat to ensure it is mounted directly against tank. The thermostat must contact the tank surface. Thermostat Reset thermostat lower to desired water temp. ECO trips Thermostat Reset RED ECO button manually. If it trips again, Quickly AND IMMEDIATELY disconnect power and check All components with a multi-meter and a visual inspection, contact DIAMOND or your local RV service center. An authorized RV Service Center should handle any additional troubleshooting.